Career civil servants should not serve in the Trump administration. Why principled conservatives and career civil servants should stay far, far away. 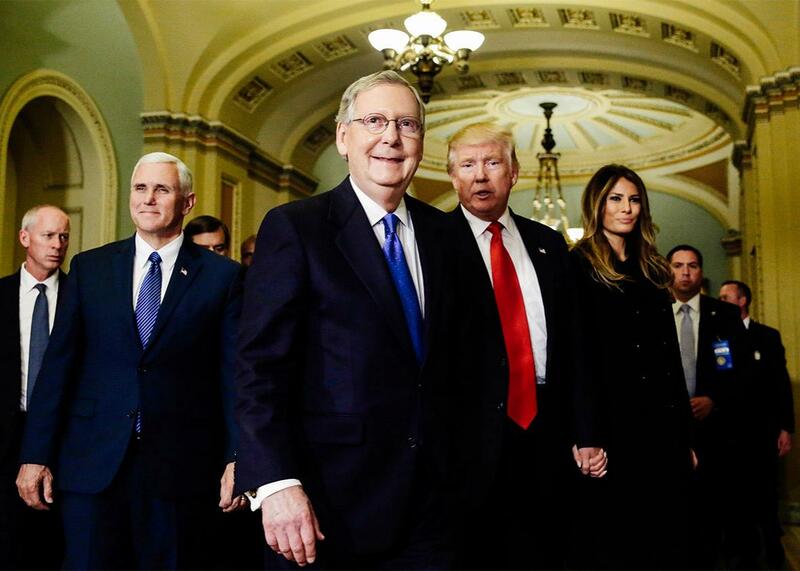 From left, Vice President–elect Mike Pence, Senate Majority Leader Mitch McConnell, President-elect Donald Trump, and Melania Trump on Capitol Hill on Thursday. Two of my friends, both of them principled and talented conservatives, told me they were approached by members of the Trump team about possible posts in the incoming administration. Both of them find Trump horrifying and did not vote for him. Both had the same initial reaction: No way. Both would have been willing, maybe honored, to take posts in a different Republican administration. All this was before the election. Now, both recognize that they face an ethical dilemma: If the transition team approaches them again, should they say yes? A similar dilemma faces career lawyers in government service who object to the new president and fear what they might be asked to do. Should they look for new jobs? As for law students and other lawyers considering government service, including anti-Trump Republicans: Is joining the administration a moral obligation, in order to fight for the rule of law and fact-based decisions in the administration of an erratic president? Or is it an unacceptable moral sellout? Should you go into the administration because it needs your voice? Or is exit, not voice, the principled option? Of course, what lawyers and officials might be asked to do in the Trump administration is at this moment a complete cipher, so perhaps it’s too soon to say. Trump has walked back some of his most horrifying campaign boasts. Given his indifference to truthfulness and inconsistency, we have no idea what his real positions are on many issues or even whether he has real positions. (Remember that last May he promised to commit war crimes, then quickly reversed and expressed respect for international law.) Nor do we know what role he sees for himself—decision-maker or, as this July article suggests, star-of-the-show who leaves policies to others in his administration. It may be, of course, that Trump wishes to fill the most important posts with sycophants. In which case anyone who goes to work for his State Department or Defense Department risks being subject not only to his whims, but also to the whims of secretaries and under secretaries who mirror his all-too-readily-apparent vices. That makes the dilemma worse, and so far, unfortunately, the signs are not good. Trump may be in the process of appointing some of the most extreme people in public life to high positions. Douthat counts on the Senate to deny confirmation—but what if the Senate does no such thing? In any event, it seems likely that the new administration will be the most right-wing in U.S. history, more than either the Ronald Reagan or George W. Bush administrations. Perhaps it will be more right-wing than Trump himself. And that, unless you share those views, is a problem. Especially if you are a nonpolitical lawyer in public service, can you stay in the job if the man or woman at the top is systematically undermining the mission of your agency, or steering it in directions that appall you, or misusing it to punish political opponents? The nightmare scenario is that Trump and his allies aim at an authoritarian Big Man presidency that actively targets political opponents—tangibly, not just rhetorically. This is, after all, a president-elect who pledged to appoint a special prosecutor to investigate his opponent and who egged on his supporters’ chant “Lock her up!” It’s a president-elect who said he wants to change libel laws so he can sue his media critics, who incited the “Second Amendment people” against his opponent, and whose inner circle of advisers includes a media leader of the alt-right. It’s a president-elect who is touchy and vengeful. Omarosa Manigault, Trump’s director of black outreach, said after the election, “Let me just tell you, Mr. Trump has a long memory, and we’re keeping a list.” She was talking about a list of anti-Trump Republicans, leaving to the imagination what other lists are stored in Trump’s long memory. I hope, and want desperately to believe, that worrying about all this is sheer paranoia; but the only way to discount all these sinister threats is by assuming complete mendacity on Trump’s part—and by assuming that no forces in his administration take seriously what Trump meant only as a sales pitch. Amid such uncertainties, nightmares aren’t the worst place to start thinking about the morality of government service. Under such dire circumstances, my answer to the moral question is straightforward. Don’t go into the administration. If you’re in it when things start going south, get out. Don’t tell yourself you can tame the beast, because the beast will tame you. And don’t let the words lesser evil pass your lips. You will be fooling yourself. Why do they forget? It isn’t hard to fathom. Once you are inside, your frame of reference changes. The work is challenging and invigorating and cutting-edge. You see that many of the people you’re working with are decent and likable. You tell yourself that decent people like these wouldn’t do anything indecent. Gradually your moral compass aligns with theirs (and you don’t notice that theirs are simultaneously aligning with yours); and gradually all your moral compasses align with The Program. You develop team spirit, and you don’t want to let your team down by shirking; you can’t be a naysayer on everything. You lose your sense of outrage, which is, after all, a feeling we experience when we see something abnormal. Once the abnormal becomes routine, outrage fades. And above all, you reassure yourself of your own decency because you can contrast yourself with the real radicals, the true believers. They’re right down the hall. In meetings, you try your best to mitigate the damage; you win a few of these fights and become heartened. But you lose more than you win, and your own sense of fair process—“I waged the good fight but lost fair and square”—leads you to acquiesce. You may even find yourself publicly defending the decision you opposed; at best, your duty of confidentiality seals your lips. Your degrees of freedom are radically constricted. Drawing on the experience of 1933 and 1934, Arendt warns that “we now know that moral standards can be changed overnight, and that all that then will be left is the mere habit of holding fast to something.” That something will be the bureaucratic new normal that you see around you. In these terms, the nonparticipators in public life … are those who have refused their support by shunning those places of “responsibility” where such support, under the name of obedience, is required. And we have only for a moment to imagine what would happen … if enough people would act “irresponsibly” and refuse support. Her key insight: When you stay in your job and perform lesser evils, you are supporting the administration, even if in your own mind you abhor it. Your own mind is irrelevant: If you participate, you support. There’s an obvious objection to her insight: Enough people aren’t going to act “irresponsibly” and refuse support. Supporters are always waiting in the wings. In fact, the new boss may be yearning to drive away the conscientious nonpolitical civil servants to make space for hard line replacements. Why give in? Why exile yourself? Or, if you’re a job-seeker: Why let the bad guy get the job? Arendt’s answer is this: In the nightmare scenario, you are deluding yourself to think you can turn the train or even slow it down. Maybe you could in an administration committed to the rule of law. But that is not the nightmare scenario we are talking about. Lösener was not an ideological Nazi; he was a conservative civil servant who joined the party because he “wrongly assumed that only this party could succeed in rescuing Germany from the not-so-rosy situation in which it found itself back then.” (Sound familiar?) And, as the new government formed, “there was an urgent search for higher-ranking civil servants who belonged to the Party.” He joined the ministry, but within months he grew disenchanted. He had an insider’s view and “saw with dismay that all the promises made before the Party assumed power had given a completely wrong picture of a future National Socialist state.” But: “Over and over again, my personal and political friends … persuaded me to remain in my position even as disgust threatened to choke me.” In his job, he could do some damage control. Outside the job, he could do nothing. In fall of 1935, Lösener got a late-night phone call: Early next morning, he must fly to Nuremberg for an important assignment. Hitler wanted to announce some big legislation at an upcoming party rally, and he needed ministry lawyers to draft it in round-the-clock sessions, with each draft going to Hitler himself for review. It was the kind of opportunity every ambitious government lawyer everywhere dreams of: a high-level, adrenaline-charged, technically demanding assignment that involves back and forths with your own boss and with the leader himself. The assignment was to draft the Nuremberg race laws. What did Lösener think about the assignment? He regarded it not just as a professional opportunity but a golden opportunity to wage the good fight for the lesser evil. The party radicals wanted the persecutory laws to incorporate a one-drop-of-blood rule for determining who was a Jew and who was not. Lösener fought for a more restrictive three-Jewish-grandparents rule. That would make the law apply to many fewer people. He succeeded: Hitler chose the more “moderate” version of the law, no doubt out of political caution. The radicals persisted, and Lösener waged his bureaucratic in-fight for years. Friction with his boss grew, until he finally transferred to a different job in 1943. If we are to believe the memoir, Lösener viewed himself to the end as a heroic rescuer who saved lives. He could always compare himself to the party radicals to reassure himself that he was a moderate. But Lösener drafted the Nuremberg laws. He never says what other legal issues he dealt with in his decade at the Ministry’s Desk of Racial Affairs; one would like to know before considering his lesser-evil plea. Perhaps he edited his other tasks out of his memory as well as his memoir. His was an epic case of false consciousness. Lösener appears never to have understood Arendt’s insight: Participation is support. Even confronted with such an extreme case, one might hesitate. Lösener may be right that he saved lives, maybe even many lives. I’m suggesting that even so he should have refused, from the get-go, to draft the Nuremberg laws. The evil was tangible, the ability to lessen it was conjectural, the confidence that his own moral compass would stay true was misplaced, and the assumption that conscientious refusal would not have swayed his colleagues is too bleak. But suppose you think all this is wrong and those in government who can achieve the lesser evil should do it. What about the large majority of public employees who are not directly complicit in wrongdoing but for that very reason have no ability to mitigate it? Arendt’s warning that participation is support applies to them as well. Not only do they keep the enterprise going; their participation normalizes it in the eyes of their colleagues and the larger public. They cannot plead “lesser evils.” If they have a realistic, nonruinous exit option, they should take it. What if there is no nightmare? But let’s suppose the incoming administration has no inclination toward what I called the “nightmare scenario” of crushing the opposition. Let’s suppose the nightmare scenario is just that: the paranoia of Trump opponents who got the shock of their political lives last Tuesday. Then the argument for service becomes compelling. But one-off nightmare issues might still crop up. Rounding up millions of Mexicans is an obvious example. From the point of view of government lawyers, the dragnet would be packed with cutting-edge legal issues, litigations, conference calls, and high-level excitement. It would also be filled with opportunities to tell yourself that you are fighting for the lesser evil, down there in the weeds of the Fourth Amendment and the Immigration and Customs Enforcement regulations. Or honoring the campaign pledge to bring back torture. So much solid law to overcome! And so many opportunities to fight for the lesser evil! No waterboarding, only sleep deprivation and stress positions. Not the military, only the CIA. Not all captives, only captives about whom there is evidence they might know something. And no mere probable cause that they know something, but clear and convincing evidence. (Or should it be beyond a reasonable doubt?) A good day’s work fighting the good fight for the lesser evil. But what if involvement in any of these things makes you sick, as it should? How far can you compromise your moral principles? Here, I will take a cue from another philosopher, Avishai Margalit, in his powerful book On Compromise and Rotten Compromises. Margalit is not a moral purist, and he does think that lesser-evil arguments are sometimes genuine justifications. Margalit’s fundamental argument is that there is a difference between bad compromises and rotten compromises. Bad compromises: yes, if they are the only way to do good or mitigate harm. Rotten compromises—never. And what is a rotten compromise? It is a compromise where you participate in assaults on fundamental human dignity. That’s a vague and porous standard, but if you are a lawyer with a conscience, you know it when you see it—provided you don’t loophole-lawyer your own conscience. Mass dragnets and deportations, torture and degrading treatment, targeting policies that accept excessive civilian casualties or ignore war crimes, deliberate failure to repress anti-Muslim hate crimes: All of these are assaults on human dignity, and compromising your principles on them is a rotten compromise. When it comes to rotten compromises of your principles, exit takes precedence over voice and loyalty. Exit doesn’t necessarily mean resigning, although it may. It certainly means refusing to participate.